Alongside a successful line of Mirrorless Hybrid cameras Panasonic continue to refresh their lineup of fixed lens Bridge cameras. Launched in July 2012 the Panasonic LUMIX DMC-FZ200 offers a 24x super zoom, 12fps continuous shooting and 1080 60p HD video. Upgraded from its predecessor, the Lumix DMC-FZ150, this latest model also boasts a fixed maximum aperture, higher resolution EVF, greater ISO and shutter speed ranges as well as a new HDR mode. 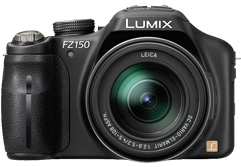 With the FZ150, Panasonic stays the course with another high-end bridge camera. From manual to completely automatic modes, the DMC-FZ150 offers a large choice of options.